Burj Al-Luqluq Social Center organized on Thursday 27/07/2017 a sport day for Jerusalemite summer camps sponsored by the Jerusalem Clubs Federation, funded by the Jerusalemite businessman Munir Kalouti and supervised by the Welfare Association. 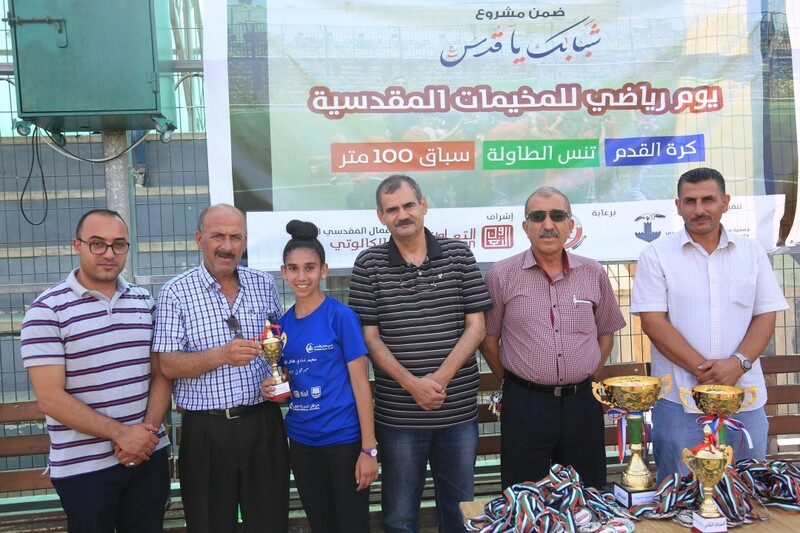 YMCA, Hilal Al-Quds, in addition to Burj Al-Luqluq Center summer camps participated in the sports day; however, the Palestinian Academy was not able to enter the Old City of Jerusalem due to the latest problems. The event included 4 main games; football, basketball, tennis and strength games. After the competition, Hilal Al-Quds won the first and second places in table tennis, Burj Al-Luqluq came first in basketball and football, while Hilal Al-Quds came second and YMCA came third. In strength games Burj Al-Luqluq player Mohammad Joulani cam first while Hilal Al-Quds players came second and third. After the competitions, the winning teas received prizes after the speech of Burj AL-Luqluq Executive Manager Muntaser Edkaidek, who stressed that this kind of events preserves the land of Burj Al-Luqluq and revives it.